What do you do when the room is not square? 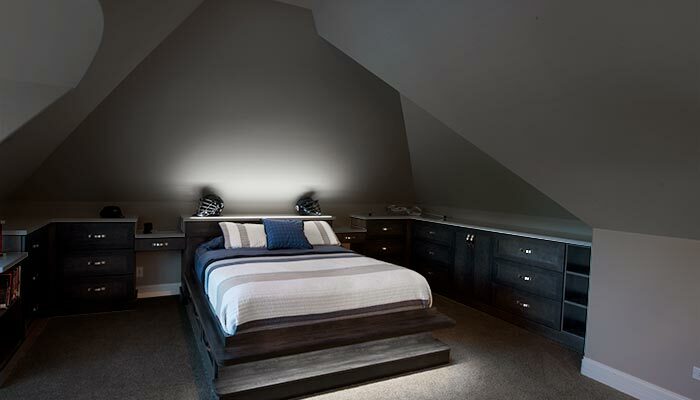 Sloped ceilings are often difficult to work with, and frequently, furniture won't fit snuggly against a slanted wall. 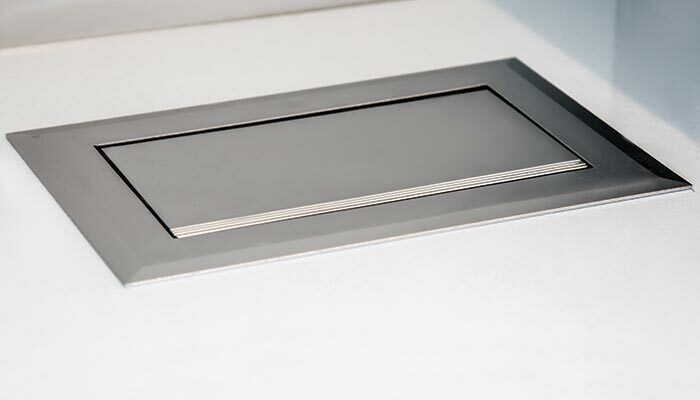 However, rooms with slanted and sloped ceilings are becoming more common and are no longer relegated to attic renovations. In most housing markets, every inch of space is invaluable. At the same time, the trend toward interesting exterior elevations with gables, turrets and more dictates that some interior rooms will have a lot of odd angles to deal with. However, when properly designed, a room with a slanted ceiling or wall can offer offer a wealth of storage that is both practical and charmingly attractive. It is essential to use the special contours of the room to your advantage when designing for this type of space. This house has a bonus room located over the garage. 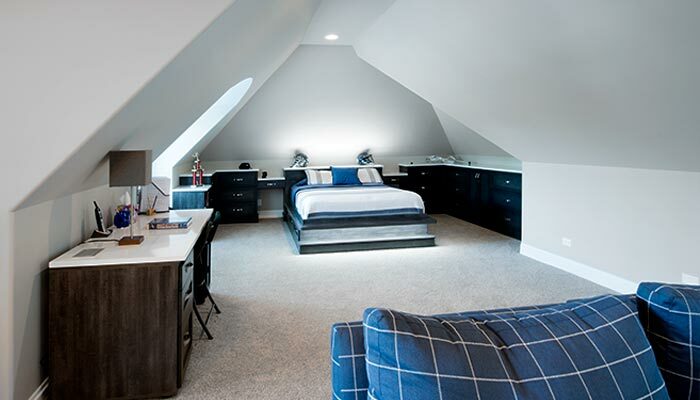 The homeowners decided to utilize it as a bedroom to accommodate the needs of their family. The problem was that standard dressers were too tall to fit snuggly against the walls which begin to slope inward just a few feet from the floor. Additionally, the bed needed to be both low and positioned a couple of feet out from the wall to ensure a sleepy occupant wouldn't bump his head when sitting up in bed. There was one small closet at the far end of the room, but a lot more storage was needed for clothes, books and sporting equipment. Having a desk in front of a window is nice for studying because of all the stimulating natural light, but when the window reaches almost to the floor, there is no way to position the desk without blocking part of the window and the crank to open it. 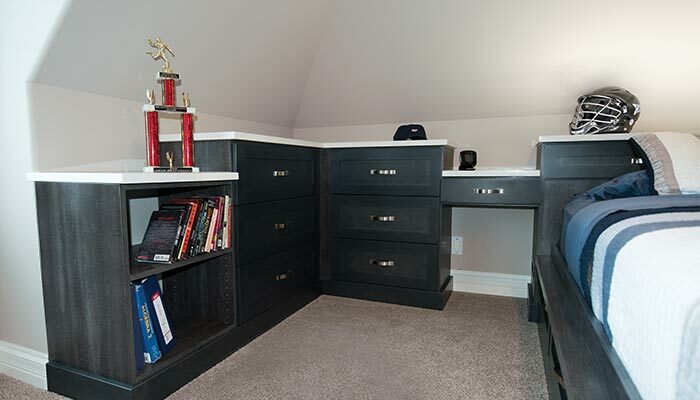 Custom bedroom furniture and desk from Closet Works was the answer to all of these issues. 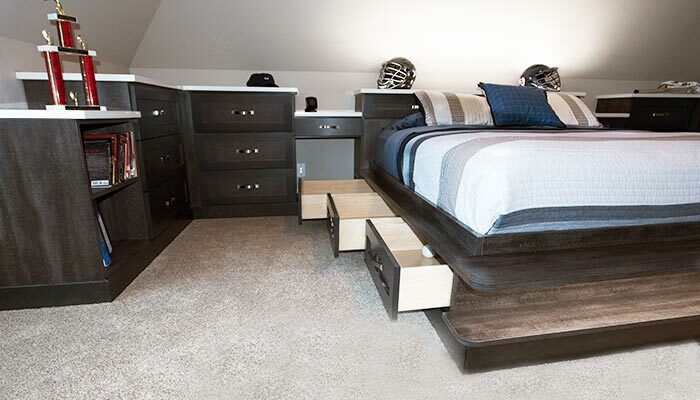 A custom platform bed was designed with six drawers underneath. The headboard for the bed is deep, pushing the mattress far enough away from the slanted wall to allow adequate headroom, and adds storage with two flip down cabinet doors behind the pillows. 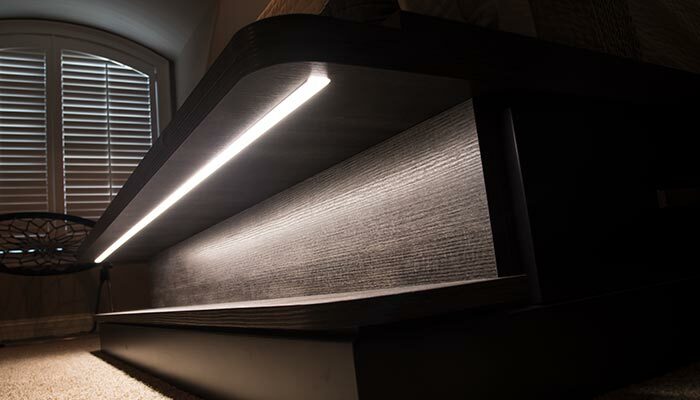 It also functions as a shelf and bedside lamp due to the integrated strip lighting along the top. Additional LED lighting was installed in the footboard, creating a pool of ambient light around the bed that is subtle, yet highlights the custom bed the way a picture lamp sheds light on a painting. It also works great as a night light. 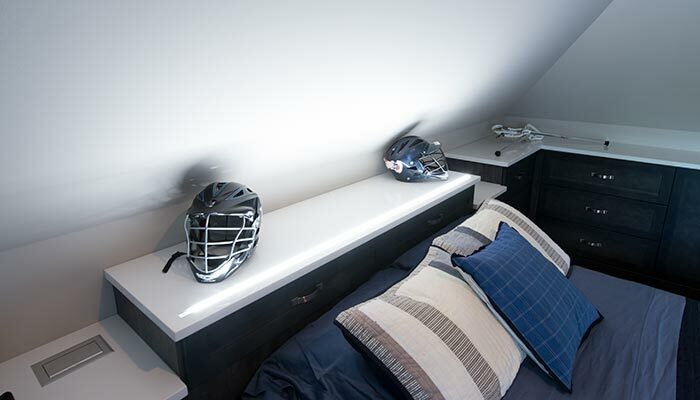 Closet Works built a low, continuous storage wall unit to wrap three sides of the corner where the bed is located. 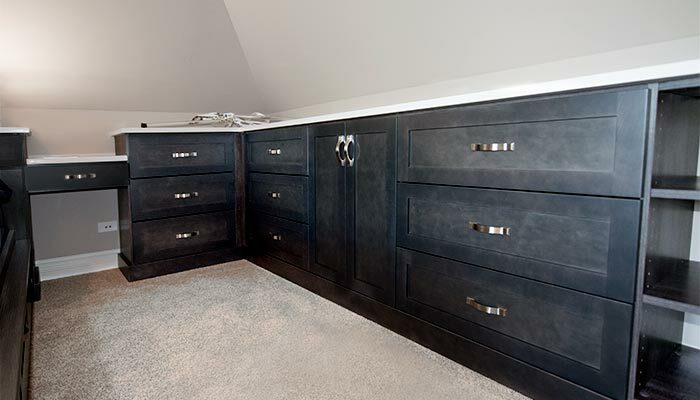 Shorter than a standard dresser, it fits perfectly under the sloped walls. The drawers, shelves and cabinets in this organization system ensure plenty of places to put away folded clothing, books and other miscellaneous items — with a place for everything, the room never needs to be messy. A small closet with hanging rods is included against the wall opposite the bed, ensuring that there is a place for suits and formal clothing that you wouldn't want to fold. 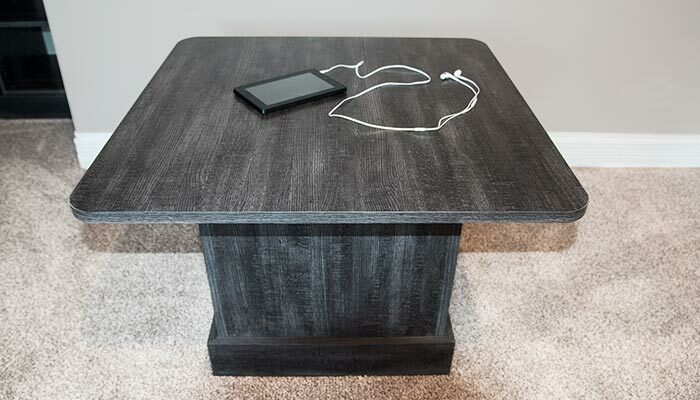 A shelf style table was attached to either side of the bed, creating the perfect nightstand. The nightstand is attached to the wall unit/dresser on the other side, melding the bed and wall unit into a single, complete storage system. 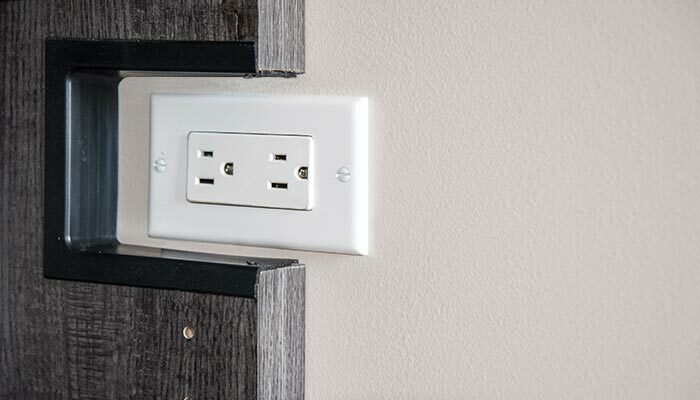 Special attention was paid to electrical outlets. 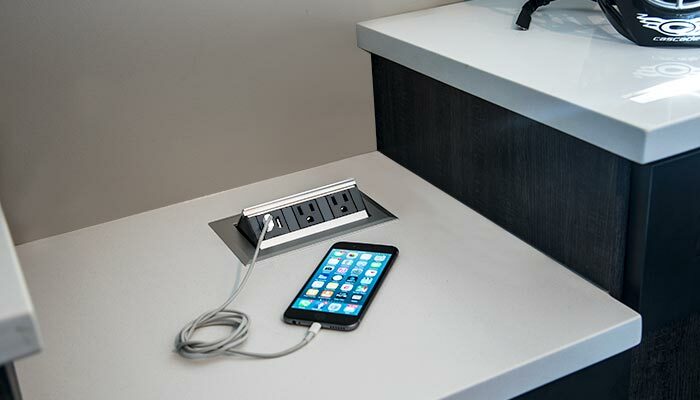 Cut-outs were provided where needed, and a pop-up charging station was included in each of the nightstands for plugging in two electrical devices and two USB devices. Another challenge of this space with slanted ceilings and sloped walls was the position of the desk in relation to the window. Ideally, it's nice to be able to rest your eyes by looking out the window periodically during intense periods of study. Unfortunately, leaving the desk permanently located in front of the window would block much of the natural light available to the rest of the room, and also block the crank for opening and closing the window. The solution was to build a custom desk on furniture glides. Most of the time, it occupies a section of all where the slant starts high enough to accommodate the height of a standard desk. However, during midterms, finals or times when long hours of study are required, it can be easily moved over in front of the window. 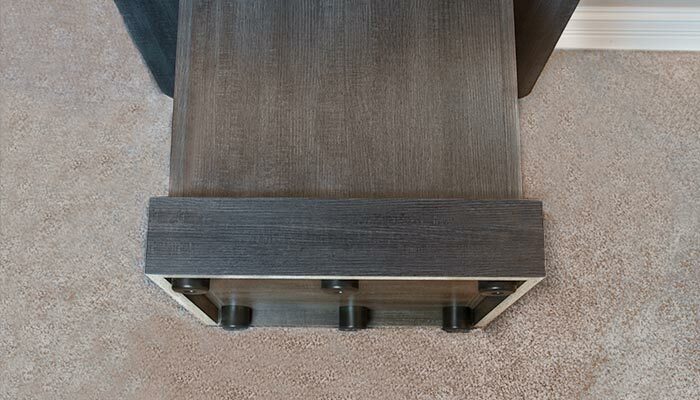 Furniture glides were also installed on the bottom of the custom end table, allowing it to also be repositioned as needed, allowing the room to be reconfigured as needed and multi-funcional.